She placed the mug in front of him, she was warm just looking at him, it had been like that since the beginning. She could still remember all the steps to the dance that got them here: all the cups of coffee, all the late night fry runs. She could still remember what he was wearing the first time they had brushed hands and it felt like a powerline had hit her. He had been in a pair of well fit light-wash jeans and a plain white t-shirt, next to her heavy boots his were stylish and sleek. She could remember the first time she realized that just looking at him could make her blush. Just seconds ago, she had been staring out the window at him thinking she was going to burn up just knowing that he was hers. As she sat down though, everything ran cold, her blush fell from her face faster than a spring thunderstorm. It felt as if all her blood had sunk into her feet, leaving the rest of her shivering and pale. She looked away from him, a cold finger running down her spine. Her heart jumped as if just shocked back to life, sluggish and uncomfortable. In an attempt to warm herself, she brought her mug to her lips and the steam felt cool. Looking over at him didn’t warm her; that molten flame in her chest was guttering. 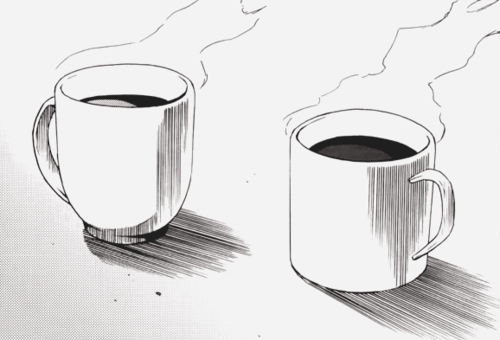 She pressed her lips together as she gently placed the mug back onto the table with a small tap. She could feel the breath in her chest jump and stumble a little, it wasn’t the normal hitch she got being near him. She lifted her mug again and let the warming steam brush its hands, like his, across her cheeks and nose. She took another sip of her coffee — bitter. She looked up at him — sweet. She put the mug down again, warmth returning to her fingers, wondering what he would look like come rainy season in the spring. Would he wear that pair of soft, fit-as-if-tailored-specifically-for-him jeans with the tear in the knees? Would he wear that black sweatshirt she so desperately had wanted to steal, would he wear the sleek black jacket, that she loved on him, over it all? She didn’t know how they were going to reach that point, but she knew they would. Her heart beat a little faster just thinking about it, but then it skipped like it hadn’t quite been beating in rhythm. She was still cold. He murmured something, pulling her out of her thoughts, “Hmmm?” She responded. He looked bashfully introspective. She watched him glance up again, with a warm glow in his face, following the trails of steam, a spaceship, into space, finding her eyes in the dark of space, staring at him cooly, like frozen stars. “I love you,” he whispered across the planet, with oceans of coffee, beneath them. She blushed gently, the flame in her ribcage sparked and gained strength slowly, an ember being coaxed back into full warmth. “I love you too,” she whispered back. An umbrella offered against the snow. She grinned at him then, content to just look at him as the clock ticked away the seconds somewhere within the cafe. She watched the easy fluidness of his movements as he leaned forward to grab his coffee mug. She watched and painted the angles of his arms as he took a drink, she followed his gaze as he looked past the awning. He was staring at the pale sun just beginning to show its face through the cloud layer, the snow persisted in small delicate wisps that turned to messy slush on the pavement. She couldn’t help but wonder what went through his head, as he watched the sun slowly appear as if dabbed into existence on a pale, gray background. She looked away from him then, and looked back into the window of the cafe toward the clock that was adding up their time. Adding up the time that he was hers, another second, another minute, another hour, all hers. She didn’t even need to look at him head-on to know how the light shining through the clouds lay on his face, making his skin look soft and downy; to know how the bridge of his nose, the center and peaks of his lips, his chin, the very tips of his eyelashes, his gently sloped forehead, and his cheekbones, sloped up, were all glowing with snowy light, like painted lines of adoration. She looked at him then, at those lines of Olympian light tracing his face like her fingertips. He was looking at her, though, out of the corner of his eye, not at the sun, not out at the world in front of him, he was looking at her.